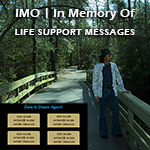 IMO - In Memory Of - Life Support Messages [IMO - Messages] - $0.00 : Beneficial Zone, Everything is permissible, not everything is beneficial! Your email required with special requests so we can respond. Create a LIFE SUPPORT MESSAGE to help Joseph James in the Follow Your Dreams Tour to place a memory of a loved one who has taken their own life, overdosed, or was taken too soon, on the Joseph James and Sentenced To Death Destined For Life Website. Many folks want to help in preventing suicide but don't know how. So many have lost loved ones to suicide and want to reach out to others contemplating it to make a difference. Just one simple voice with a loving message might just make a difference in a life or death decision. We have provided a way to share your message on the Joseph James and Sentenced To Death, Destined for Life website as well. Simply create your message and we will place the name of the loved one you lost, your name, and a short message you want to add on the websites. This will serve a two-fold purpose. #1. You will be able to tell someone else your story about how much your loved one meant to you. Perhaps this will make a difference to someone who reads your memory. Perhaps it will convince them that their loved ones care for them as well. Sometimes it doesn't take much to change one's mind. #2. Your memory is an ongoing testimony to everyone who reads it, of a life that was taken too soon. Everyone matters and has a destiny to fulfill. It costs a lot of money for us to tour, minister and maintain websites. We've been traveling for four years, paying our own way but together we can do even more. Thank you for your support and prayers. See you on the road!